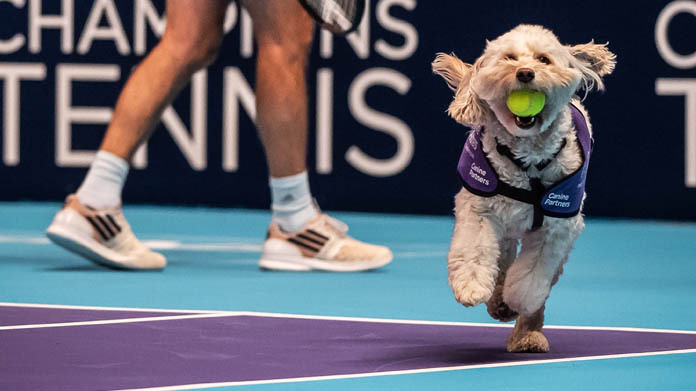 A wee bit earlier this year, we announced that Champions Tennis – which sees a host of stars of the game come together at The Royal Albert Hall for four days of tennis – was contemplating the additional of Briths Balldogs (see what we did there) to the tournament. If we’re totally honest, it was all a bit tongue in cheek and a spot of PR fun to drive ticket sales for the event (which duly it did, as it goes). It got some pretty decent coverage at the time – not least because we managed to rope one Mr Tim Henman in to make a film with a host of fluffballs recruited specifically for the purpose. Daily Express, Reuters, ITV News … a bunch of regionals. But then things took a turn for the odd. The lovely people at Champions Tennis took a call from a company that wanted to sponsor the Balldogs at the event itself. Amazing. It was at that point that we had to work out (rather swiftly) how to make the whole thing real and ensure that our “trial” well ahead of the tournament could comfortably become a reality in front of thousands of paying fans. The story has made across the ITV national news (where we were a two minute slot), Channel 5 News, ITV London, Buzzfeed News, Buzzfeed UK, BBC News, BBC Radio five Live, CBBC Newsround, Euronews, Reuters, Huffington Post, Eurosport, Yahoo!, Independent, NBC News and hundreds of regional media titles (including YEP, The Scotsman as a couple of tasters.